I HATE the moving process. Just last month, I finally finished helping my folks move up to the Central Coast from LA…that was a long process of organizing, purging, setting up garage sales and packing. Honestly, it’s an exhaustive process, but the best part is the purging. I find that as the years tick on, the accumulation of stuff is unavoidable. Don’t get me wrong, I’m not a hoarder…I may loooove a bargain, but I also LOOOVE to give things away. Usually this makes for a really good balance…living with open hands. Just this weekend, I had the privilege of benefiting from another person’s open-hand living. A friend of mine had a neighbor moving (aka a total stranger to me). Whelp, this total stranger heard about our business and arranged for me to come and pick up some furniture (for free!). I was obviously happy to receive, but I think he was equally happy to be purging and “cleaning house.” You know the feeling….it’s like what a fresh coat of paint does for an old room…or in this case a dated side table 😉 . (Sorry for the pic quality on some of these…I took some with Sean’s iPhone, and apparently is was dropped one too many times…wahhh). First step was to prime, and then decide on a color and design scheme. Obviously, I was a fan of all the carvings and wanted to play them up…but I also wanted to honor the “cleaning house” mentality by zesting this table up with some freshness. What’s fresher than a sunny yellow?? Happily, I had some yellow spray paint left over after doing my Yellow Ombre Chairs ages ago. So, the legs turned Marigold yellow…things are looking brighter and fresher already! Now for the top. Maybe you have already guessed it (I know that the title made it hard 🙂 ), but I decided to go with the insanely trendy color combo of yellow and grey. So, I rolled on a soft grey, and then I took my artist brush to work up the nooks and crannies with a darker grey. (Yay for my Nikon pix!) 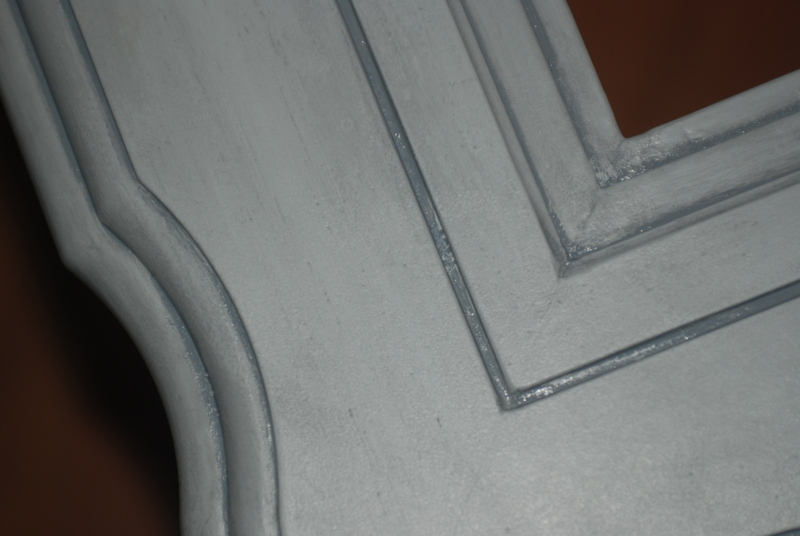 After I smooshed the dark grey into the grooves, I used a damp rag to wipe off the excess and add some texture. I was really pleased with the subtle stone effect it gave the top. I then decided to go over all the carvings on the yellow legs with the grey. With a light hand and a damp rag, I was able to accent the carvings without making it too garish. I think it turned out looking pretty smart! And what a zinger to add to a living room…instant energy and freshness for your home! As the days get darker and winter approaches, maybe you need to think about adding some Marigold yellow into your home! Thanks for stopping by and checking out how we are Zesting things up!